This is a first for the Hammershow — a Hammer horror film that does not feature either Anthony Hinds, Terrence Fisher, Jimmy Sangster, Peter Cushing, or Christopher Lee in the credits. What sacrilege is this? Not to worry. That august group of filmmakers and actors is not required to make a good Hammer flick, although it helps. 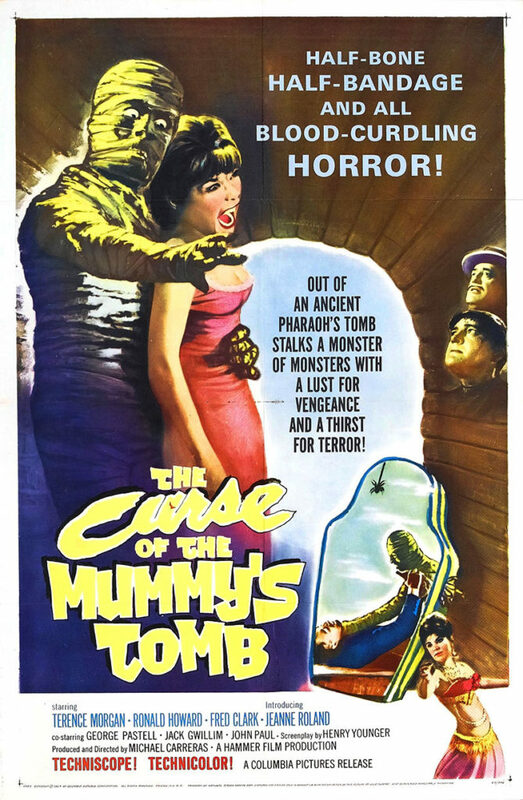 The Curse of the Mummy’s Tomb is the 1964 follow-up to The Mummy. None of the characters from the original return, although George Pastell plays a character that I think is a cousin of the character he played in The Mummy. When I say that none of the characters return, that includes the titular monster. We viewers are getting an entirely new story, with an entirely new mummy, although the basic story threads are consistent with just about every film featuring a reanimated Egyptian mummy ever made. It is the year 1900. In Egypt, a British expedition has discovered the lost tomb of Ra-Antef, an outcast son of the pharaoh. Like all Egyptian tombs from the time of the pharaohs, opening it carries a deadly curse for those who would disturb its peace. Early on one of the expedition’s leaders is killed. But not by a mummy. Oh, no. Viewers have to wait a long time to get a glimpse of the mummy in this film. Rather, some local fanatics are the ones who carry out the first act of vengeance. But after that, it’s on to England. There, the sponsor of the expedition, American businessman Alexander King (Fred Clark), has big plans. He’s going to put together a traveling exhibition. He sees money to be made, and feels storing the artifacts in a museum in Cairo is a wasted opportunity. One of the expedition’s leaders, Sir Giles Dalrymple (Jack Gwillim), is horrified at the prospect that such treasures would be shipped around the world for profit. He resigns and crawls into a bottle, but another Egyptologist on the expedition, John Bray (Ronald Howard), takes over his position. Rounding out the expedition is Pastell as Hashmi Bey, an Egyptian and official with the local Ottoman government, and Jeanne Roland as Annette Dubois, daughter of the slain expedition member and Bray’s would-be love interest. I write ‘would-be’ because Mr. Bray has competition in Adam Beauchamp (Terence Morgan), an English aristocrat who takes a keen interest in the expedition and its finds after they return to England. His motivations are unknown, but he knows far more about ancient Egypt than he lets on to his new friends, and he wastes no time inserting himself between Annette and Bray. The more she falls for his wiles, the more Bray seethes. The more a viewer would, too. He’s not slimy, like other film characters in his position, but man, he moved in on Annette so quickly, and with so little regard for Bray, that he deserves a punch in the mouth on general principle. But, this film is not a love story. It’s about a mummy. Eventually. Before the mummy shows up, with 27 minutes left, writer, director, and producer Michael Carreras stitched together a somewhat uneven film. It’s almost all setup, and the pace of the film suffers somewhat for it. What holds the film up during this long stretch before the mummy gets to work are fine performances from the cast. They’re not what I expected from a cast without Hammer’s giants in it. Even Clark, who was forced into caricature, still has loads of charm. His brashness is infectious, and I was rooting for him to survive to the credits. In the final act the mummy does appear. The costuming could have been better, but boy does he know how to make an entrance. Bray and the others do battle, and just when it seems there’s nothing new for the story to tell, there’s a final twist involving Beauchamp that provides a very good payoff for a film that had been just plodding along somewhat. The Curse of the Mummy’s Tomb is always in danger of being plodding mediocrity, but Carreras saves it with a timely death or plot point. The big finish is what seals this as being a decent Hammer horror flick.